I’m going to join a wine club today. Me, who rarely buys wine, because I simply don’t need to. My consulting clients usually give me wines to taste and wineries and PR companies frequently send their wines for review. This doesn’t preclude me from buying the occasional bottle of Pinot Noir, Zinfandel, Cabernet Sauvignon, Gewürztraminer, Rosé, sparkling wine or other must-have treats when I’m out and about in wine country. Sometimes, a girl’s just gotta lay down the dollars for that special bottle or six. The wine club I’m going to join is The Wine of the Month Club. This is not a paid endorsement, by any means. I’m joining because I was just so impressed with what they are doing now, and have been doing for the past 40+ years. Check out the website and you’ll see what I mean – there are offerings for every palate, videos to amuse and delight and much, much more. I predict you’ll join this wine club too. 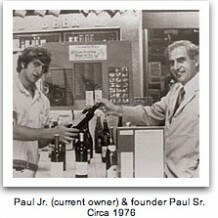 I recently had the pleasure of speaking with Paul Kalemkiarian, Jr., President of The Wine of the Month Club. Paul is a man who loves his job. He wakes up every morning and says, “Wow! I get to go to work today!” He loves working with his staff to provide excellent customer service, choosing only the best wines for his customers and “Thirsty Tuesdays,” where he and his staff taste up to 75 wines in a sitting. This is a man after my own heart. That’s why I’m joining his wine club. My first experience with Wine of the Month Club was as a salesperson. It was about 10 years ago and I was working for Limerick Lane Cellars, doing my outside sales/ schlep the wine around Southern California gig. I went in to pour some samples for Paul and his staff. They were prompt and gracious. And they bought wine from me. This is not always the case when you are pedaling wine on the street. Buyers can be downright arrogant assholes. Not the case with these guys. Another reason why I’m joining this club. Other noteworthy features of Wine of the Month Club is that they use only recyclable packaging, offer a great selection of organic and Biodynamic® wines and their wine selection in general is amazing and reasonably priced. I’m joining the club. Are you?